The National Universities Commission has developed a Software Package; Nigerian Research and Educational Network (NgRen), which interconnects all the Universities in the country. The package is a video conferencing platform that allows for the exchange of research and educational exploits amongst Universities. 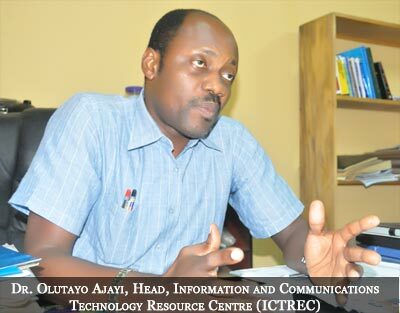 In a brief chat with FUNAAB Bulletin during one of the test-run sessions, the Head, Information and Communications Technology Resource Centre (ICTREC), Dr. Olutayo Ajayi, stated that the essence of the package was to promote collaboration through research, teaching and extension services. According to him, “the Honourable Minister of Education could hold a meeting with all the Vice-Chancellors without physically going to Abuja. A Lecturer in the Ahamdu Bello University can lecture students in the University of Ilorin and Federal University of Agriculture, Abeokuta (FUNAAB) altogether through the platform without them coming together”. He added that the package had been extended beyond video conferencing by including the sending and receiving of data in addition to calling through Internet Protocol (IP) Phones to one another, free of charge. Dr. Ajayi added that the only feature that is not included in the package is the ‘shaking of hands’, which eludes the people meeting on the package. He said South Africa had been using the package for over three years while Nigeria has just signed a Memorandum of Understanding with some foreign universities based in the United States, United Kingdom, among others. The Deputy Vice-Chancellor (Development), Professor Felix Salako, who represented the Vice-Chancellor, Professor Olusola Oyewole, had a conversation with the NUC Project Coordinator, Dr. Joshua Attah, in the course of test-running the equipment.